Guys, I have this crazy idea. I suspect it’s crazy because two of my closest friends, who also happen to be knitters, responded with much less than their normal enthusiasm when I ran the idea by them. Katy said something like “I don’t know, the combination might be a bit much” (which it could be) and Bridgit’s comment was “That looks like the most boring knit ever” (which I really can’t argue with)… and yet I think I still want to do it. It’s about as instant-gratification as a knitted blanket can get, and I do not have a knitted blanket, and that is a shame. 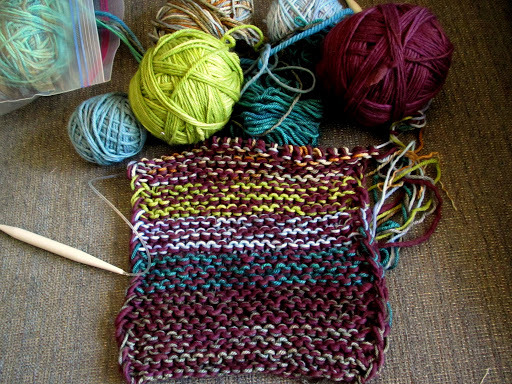 I’m intrigued by the opportunity for lots of fun color and texture effects by mixing up different kinds of yarn. It’ll eat up yarn like whoa. The pattern sample took 3200 yards combined. 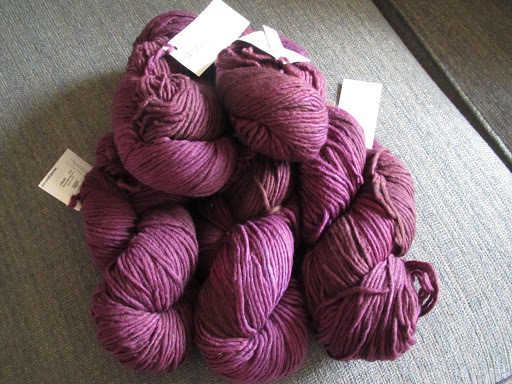 I might have a spare skein or two of yarn (hah!) that could use knitting up. Especially leftovers. Crazy, beautiful, or crazy beautiful? That swatch is just about 20 sts cast on and I changed color every three garter ridges. The bottom stripe is some of that Zaftig Bugga I used for one of my three cowls. The next stripe is a deep olive green colorway of DK weight CY Traveller yarn and the teal is a bit of VG Mondegreen, both leftover from my Beribboned Hat samples. Next up is some more Traveller that I had used for my Beribboned Wrists. Then there’s some bright green Malabrigo Rios from little Lyra’s hat and a bit of variegated Zen Yarn Garden yarn I used in my aunt’s Christmas cowl. 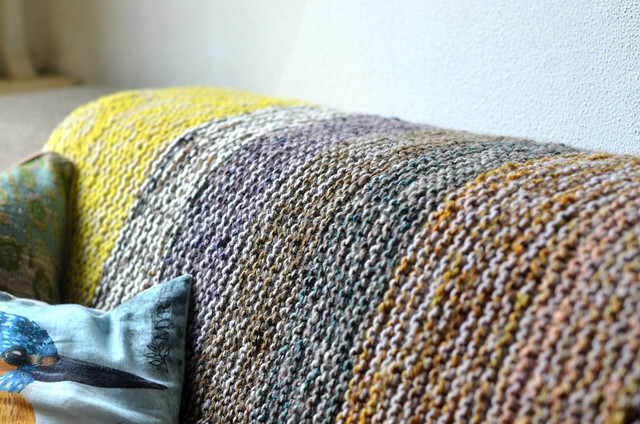 They’re all very different yarns but I think they all work when combined like this… what do you think? Had any crazy ideas yourself lately? 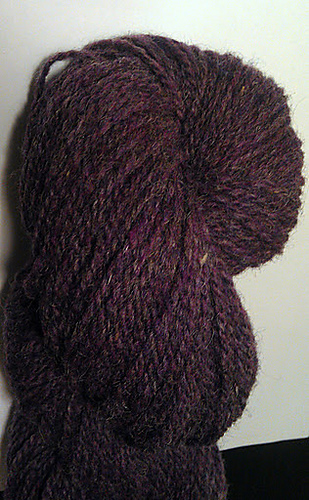 This entry was posted in Malabrigo by shoelaceswitcher. Bookmark the permalink. Crazy beautiful. Maybe not the most exciting pattern, but fiddly+exciting don't always = beauty in my book. At first I thought you were a little crazy, but that swatch has me thinking otherwise. I think that blanket will give a good amount of contrast on the couch. And I personally would stick to cooler tones like the green, blue, grey, and white scraps you suggested. So I say, Go for it! Not crazy. Not at all crazy. Of course, I may have just queued that same pattern, tagging it “handspun,” so you'll have to consider the source of the evaluation of not crazy. I have a couple of (other) blankets lined up, and while I expect them to be lessons in endurance, I know that they'll be much loved– as evidenced by the amount that I adore the afghan I got from my grandma, in all its yellow-and-brown-70's-acrylic glory. Just don't give yourself a deadline. Goals are good (as in, I'll knit three rows a day), but deadlines make me all the more likely to abandon a project in the back of the closet, delete its project page on Rav, and deny all knowledge of its existence. Just sayin'. I'm agreeing with a lot of the other comments that say it's crazy enough to work. like unionjgirl, I'm definitely an “All the colors” sort of person, so I think if you have a need to fill, I would totally do it. 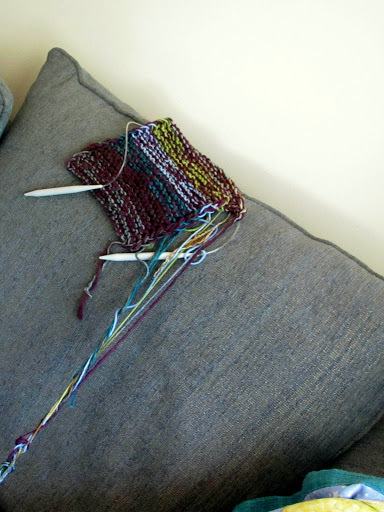 Two strands on bigger needles will definitely increase the speed and stuff. having something basic to work on in between more complicated projects may be really good! I say “go for it”! The swatch is gorgeous. Since it is a blanket, just make sure that you also like the texture and softness of the fabric. The colors go very well with your couch, too. Crazy AWESOME! However I am probably not the one you should ask right now because I am trying to decide which of the 4 blankets that I want to knit (1 for each of my 3 children and one for the sofa…….or maybe a bedspread for me, ok I guess 5 blankets) first. I did have a crazy idea – to knit hair accessories with scrap yarns. Did I already mention those to you? I did to someone. I like the blanket idea, I just hope you get it done in time to use it. And it's supposed to SNOW here Thursday….